In the early days of robots people said, ‘Oh, let’s build a robot’ and what’s the first thought? You make a robot look like a human and do human things. That’s so 1950s. We are so past that. OpenROV is an underwater robot, roughly the size of a toaster, and definitely not human-shaped. The device is controlled through a Node.js-based web app. Former NASA researcher Eric Stackpole and Make Magazine columnist David Lang are on a mission to democratize ocean exploration in the same way that Jobs and Woz sparked the democratization of computing. Eric and David pooled their talents to launch OpenROV, building on the foundation laid by Moore’s Law and the open source software movement. 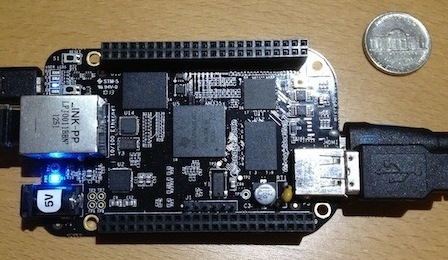 BeagleBone Black - an open-source single-board computer, smaller than a deck of cards, running Linux. Linux - specifically, the Ubuntu distribution. Arduino - inexpensive micro-controller commonly used in robotics projects. TCP/IP - the communication protocol of the Internet. TCP/IP handles all communications (commands, video) between the OpenROV and the pilot’s laptop. The OpenROV team has released all of their schematics and source code to the open source community, hence the word “open” in the company name. If you think the open source aspects of OpenROV are exciting, wait until you hear about the company’s main mission: Underwater exploration. Eric and David were kind enough to invite me to their lab/manufacturing facility in Berkeley, California recently. Thank you, OpenROV makers! ROV is short for remotely operated vehicle, an underwater robot. Scientists use ROVs to study marine life. Oil companies use ROVs for underwater construction and inspections. Industry-grade ROVs are priced at $30,000 on the low-end, while a custom ROV can cost several million dollars. The OpenROV team was convinced that they could design and build an ROV small enough to fit in a suitcase, and easy enough for a citizen scientist to assemble and maintain. Targeting the general public meant achieving a relatively low price point: under one thousand dollars ($1,000.00). They did it. The device is successful, and you can buy an OpenROV kit today for $849.00. 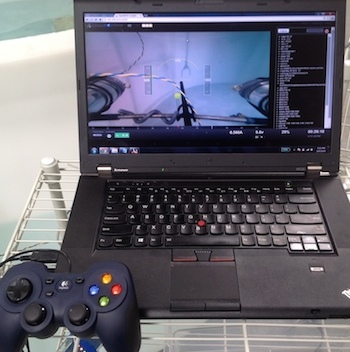 Movements are controlled via a USB-connected video game controller. A Bluetooth-equipped controller should work just as well. Some users will prefer the laptop keyboard; that works too. In other words, the computer that you’re using to read this article can probably control the OpenROV. Our world will always need professional scientists, people working in academia and in industry to push the frontier of knowledge. Some scientific problems require the attention of PhD-level professionals, while other problems are better solved through crowdsourcing. Enter the citizen scientist. Professional scientists are good at analyzing data, because that’s what they have trained themselves to do. But data gathering requires less training than analysis. Citizen science and crowdsourcing work when there’s an overwhelming volume of data to gather. Or when the breakthrough is beyond the reach of current scientific knowledge. Citizen scientists may be constrained by money, but they tend to be unconstrained by expertise. Therefore they are likely to try solutions that experts would never consider. Orville and Wilbur Wright were citizen scientists. Professional scientists pursued solutions for fixed-wing flight prior to the Wright brothers’ success. But since the flight problem defied the known science of the day, new approaches were required. No flying machine will ever fly from New York to Paris …[because] no known motor can run at the requisite speed for four days without stopping. Shifting back to the 21st century: Thousands of citizen scientists are using OpenROV to explore oceans and lakes more thoroughly than ever before. On the day I visited the OpenROV factory, other underwater enthusiasts were on-site, working with company engineers on product improvements. One enthusiast is a professional pilot of manned submersibles, underwater vehicles large enough to hold people. This pilot has traveled as deep as 2,000 meters below the ocean’s surface! “We’re always looking at amperage”, she said in a discussion with another enthusiast. A spike in amperage could indicate a ground fault, and batteries drain rapidly when that happens. You do not want to be stuck underwater when the batteries run out. 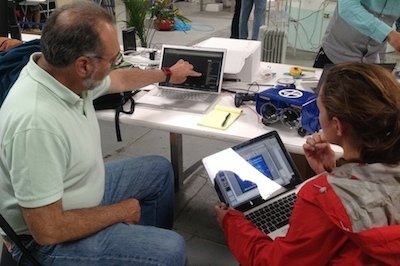 Another member of the open source community, an engineering veteran with decades of experience at Apple and Oracle, translates the operator’s feedback into code that might drive the next OpenROV user interface. That’s how open source works at OpenROV. I offered to leave when the OpenROV team prepared to test some new components. After working in tech for decades, I’ve learned to respect a company’s right to protect secrets. Yes, they had to remind me about the real meaning of open source! 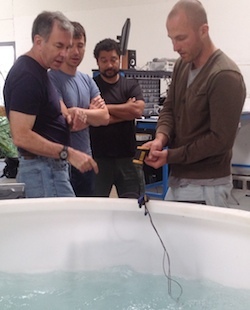 Four OpenROV makers gathered around a tank of water to test a new motor, controller, and propeller combination. They measured power utilization, propulsion, and temperature. Power utilization is important because the batteries need to last. Temperature matters because we don’t want the OpenROV to melt underwater (or fry the fish). And propulsion matters because if the unit can’t move, what’s the point? From the reaction of the team, it looks like they found some good components for the next batch of OpenROV kits. The mood in the OpenROV lab is a blend of excitement and technical expertise. Some of the people in the lab are members of the company. Others are adventurers fascinated with this inexpensive, effective way to explore. All are united in the quest to do something awesome with technology. OpenROV is what we get when the thirst for exploration blends with the open source movement. What a wonderful combination.